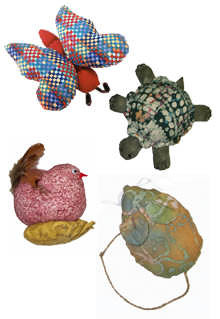 SHELLY TURTLE---An adorable baby turtle puppet for the young at heart with an even smaller stationary turtle which can be used as a pin cushion if filled with cotton or as a paper weight if filled with plastic pellets. In a matter of minutes, you can have Shelly walking across the floor with it's own unique stride. Sure to delight one and all. 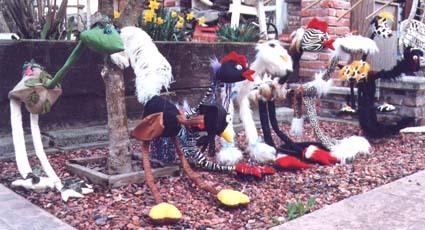 Shelly can be made with a wide range of fabrics including brocades, corduroys, swede cloth or cottons. 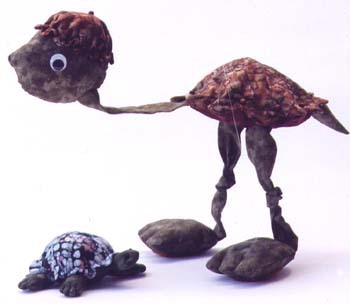 Making Friends - Shelly Turtle and Little Bit by Roberta Dent. A sure fire winner!! 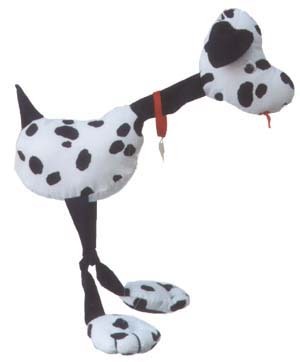 Our most popular string puppet to date. 13' tall with a small turtle for a pin cushion. Look for LITTLE BIT in the Small Fry Friends pattern elsewhere in this category. Moda Marbles are now available for Shelly. Contrasting carpet thread for toes. Fiber fill; Glue..tacky glue or glue gun; Curved needle; matching threads; 1 1/2 feet of jute.